How to print out SQL query results of TFS test records, in C#? I am trying to setup a layer of security for our on prem TFS 2018 server. We have created AD groups for each project collection that acts as an “authorized list of users” for the collection. Unfortunately, as a project collection admin, I can add a user that is not part of that valid user group, but is a valid network account. This is to not be confused with a TFS ValidUser account. For Example, account first.last1 is in a TFS ValidUser group, account first.last2 is not, but is a valid network (non-TFS) account, and I am still able to add that user to a project. TFS Server ValidUsers (server level) -- we would like for this to just be the custom created AD groups per project – Ex: Project1-ValidUsers, Project2-ValidUsers, etc. 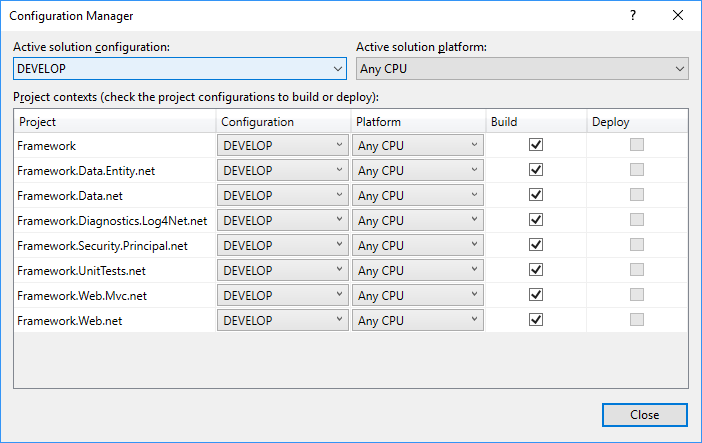 Project Collection ValidUsers – would just be the specific project user group – Ex. Project1-ValidUsers – Not allow other Project Collection’s ValidUsers to be listed in the Add Member option. Project Level - All People/Group fields would only pull users from that Project Collections ValidUsers, not the entire TFS Systems. I assume we have missed something on #1 above and it’s pulling in all network users as a Built In group or something similar but I am not familiar with that granular level of permissions. The current setup is default TFS groups and permissions. I am trying to clone connect a TFS server into my local desktop git repository. How do I resolve error below? I am trying to connect to local C:\ with a dollar sign. The item $/source/gittest was not found in the repository. I am trying to setup & apply a custom BUILD CONFIGURATION for the current version of Azure DevOp's. I have looked at various online examples...but many are either old...or don't "really" explain it well. How do I setup my specific PIPELINE to run using, say, using the 'PROMOTE' BUILD CONFIGURATION? How can I verify it did, in fact, use said BUILD CONFIGURATION? I need help in printing out results of query in TFS. I am running code to get test case and test execution records from TFS. The extract works and I get the list of all the work item, with all the associated information. I figured how to print out standard TFS fields. But I can't find how to print out fields that are custom fields (that is, we added them to TFS test-case record; they are not there out-of-the-box). Is there a way to run the query and instead of getting a collection of records, just get the raw output strings that an SQL query would print to the screen, had I ran it directly on the DB? Below is the code I use now. To get it to run you'd need to replace the "path to my DB" with the right path, and [A custom field] to the relevant one. The problem I am struggling with is how to print out the value of my custom field, hopefully without having to figure out where in the workitem it resides. But: I don't want to have to figure out, for each custom field, in what items location it is; also when trying to put the above in the Console.Writeline statement (or assign it first to a variable), it does not compile. 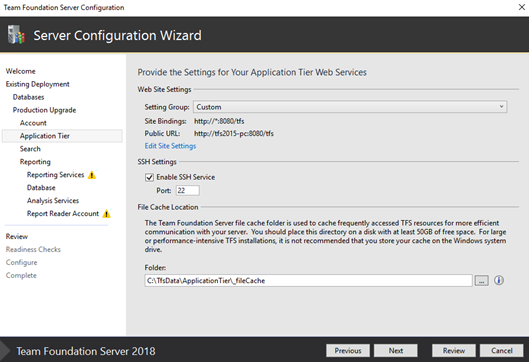 I am installing TFS 2018 in a Windows machine, using https. I have a certificate for my domain, issued to *.domain.org. I wanted to access TFS using this URL: https://alm.domain.org/tfs. When I was trying to install TFS I realized I could change the public URL to: https://alm.domain.org but NOT to https://alm.domain.org/tfs. On a TFS 2018 server, I'm trying to set up automated build and deploy. The build is running fine, but I can't seem to get the publish/deploy to work (tried several methods). The application is a ASP.Net MVC website. One approach is to use MSbuild parameters to choose a PublishProfile, but I get an error stating that the profile does not exists. Can't figure out why, cause to my understanding it does exist. Anyone who'd made this work? Or have an easier approach for automated build and publish from TFS 2018 to a folder? I've installed TFS 2018 in a machine. In the installation wizard I had some options regarding the "Web Site Settings". After the installation how can I change those settings? I need to change the Site Bindings. Can you tell me how to do that please? EDIT: I've found out that I can change it in IIS (site bindings). But is it a good practice to change it in ISS? And it's that enough?